Useful tips for the kitchen: about the equipment of this special, oft-used room in our home. There are so many kinds of kitchen flooring that it may be quite difficult for you to choose one. Each of the possible flooring materials has advantages and disadvantages. The best way to choose your flooring is to answer the questions below. 1. How do you spend your time in the kitchen? If you spend a long time standing up, you will want the flooring to be comfortable for your feet. For that purpose, use softer materials, such as vinyl, laminate, linoleum or cork. You can use a carpet as well, but it isn’t usually very appropriate for the kitchen, where you need durable and stain-resistant floorings. However, there is no problem if you wish to use hard materials such as ceramic tiles, stone or concrete. Just put kitchen rugs on the places where you spend most of your time; around the sink or the range for example. With rugs you will also remove cold and noise, which can be a problem when using these hard materials. 2. Do you often spill liquids on the floor? If so, choose kitchen flooring that is easy to clean and maintain, such as vinyl, laminate, glazed ceramic tiles or linoleum. No matter how stain-resistant these materials are, you should always clean up spills immediately. You will probably need to take extra care of floorings such as concrete, matte ceramic tiles or stone (e.g., resealing them periodically). They have a tendency to stain. 3. Do you often drop objects on the floor? If so, choose such materials for your kitchen flooring as vinyl, cork or laminate. Using these materials will reduce the likelihood that dropped objects, such as glasses and plates, will break, because they soften the shock. 4. Do many people use the kitchen? If the traffic in your kitchen is high, choose a durable kitchen flooring, such as concrete, stone or ceramic tiles. Some kinds of wood and laminate may also be durable, but you have to take care not to allow them to absorb water, because they may spoil. A good property of wood is that you can renovate it after a number of years. With other floorings, you will have to replace them completely after they wear out. 5. Do elderly people or children use your kitchen? If so, it will be better to avoid slippery kitchen floorings, such as glazed ceramic tiles, some kinds of stone (for example, marble) and waxed wood. Choose a textured flooring, but take care not to choose a flooring with too much texture, because that will be difficult to clean. 6. Do you intend to install a radiant heat system under the kitchen flooring? Not every flooring is appropriate for such a heating system. You will need to use non-combustible materials, such as stone, ceramic tiles or concrete. 7. Do you prefer natural or artificial material? Natural materials for kitchen flooring are stone, ceramic tiles, wood, linoleum and cork. Artificial materials are vinyl, laminate and carpet. 8. Is there any moisture in your kitchen? If so, choose moisture-resistant materials for the flooring, such as ceramic tiles or stone. You should be aware that it is not just cooking and washing that causes moisture in your kitchen. The location of your kitchen itself is also a factor. If it is at, or beneath, ground level, it is more likely that there will be moisture. 9. Does your kitchen have an exterior entrance? If so, your kitchen flooring will become dirty more quickly. Hence, choose from the easy to clean floorings mentioned above. 10. Does anyone in your home have allergies? If so, choose hard materials such as ceramic tiles, stone, concrete or wood; they gather less dust. Although they are softer, you can also choose cork and linoleum, because they also do not attract dust. 11. How much sunlight enters your kitchen? If sunlight reaches the floor of your kitchen, it may cause some materials to fade, such as vinyl, wood and cork. 12. Is the price of your kitchen flooring a factor for you? The price depends on the material and the complexity of your flooring installation (it may also vary according to manufacturer, retailer and region). As far as the material is concerned, you can purchase comparatively a good one fairly inexpensively. It is priced by the square foot. Less expensive materials for kitchen flooring are vinyl, linoleum, laminate and ceramic tiles. Some more expensive ones are concrete and stone. When you go to the store for materials, take a plan with the measurements of your kitchen. This will enable the store assistants to tell you approximate price. Also tell the assistants about the location of the kitchen in your home. 13. How do you want your kitchen flooring to be installed? if it will be pervious to water. if it will come unstuck. a) Whether your actual substrate in the kitchen where the flooring will lie is appropriate for the purpose (the flooring and the substrate must be compatible). This substrate can be plywood, cement or concrete. b) If the substrate is not appropriate, he will know how best to prepare it. c) If you replace old kitchen flooring with a new one, he will remove the old flooring properly (some floorings are more difficult to remove than others). He will also tell you if it is possible simply to install the new one on top of it. This is possible if your new flooring is laminate or wood. the passage to the adjoining rooms. the height of the kitchen cabinets. eventual shortening of the kitchen doors (if they are interior). If the level of your kitchen had, until now, been different from that of the adjoining rooms, now is the right time to even it. 14. What design do you want your kitchen flooring to have? You can lay your flooring in the shape of tiles, sheets or planks. If you want tiles, choose large ones. 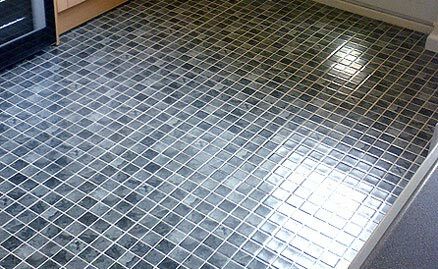 There will then be fewer gaps between tiles, thus making it easier to clean your floor. The grout that fills the gaps between the tiles gathers filth. On the plus side, the darker the grout is, the more difficult it is to see the dirt that will gather. For example, if your countertop or the walls in the kitchen are light brown, you can choose a darker shade of brown for the flooring. If your kitchen is small you can choose flooring with a large pattern. This will visually widen your room. If it is spacious, it will be better to avoid single-color flooring with a bright color, because everything may become too bright. If you want your kitchen to be lighter, choose a light color for the flooring, because light tones and shiny surfaces reflect the light well. If you want to create a more intimate atmosphere in the kitchen, choose a darker color for the flooring. If you want a variety of colors, patterns or textures, choose such materials as vinyl, laminate, ceramic tiles or concrete. The first two materials may imitate stone, ceramic tiles or wood, which means that you can have the same appealing effect at a lower price. 15. How to get the best price on a kitchen flooring? Amazon and BuildDirect appear to be some of the best places to buy the kitchen flooring from. Besides the best prices, their customer friendly policies make buying from them a pleasure. I have been looking at ‘luxury’ vinyl tiles, and can’t find any reviews on the Internet. There is a vinyl ‘grout’ installed between the tiles. Would they be appropriate for a family room/kitchen installation? How easy to clean? Etc. Who has advice and/or suggestions for Cindy? I saw similar luxury vinyl tiles on http://www.builddirect.com/Luxury-Vinyl-Tile.aspx. They say that the tiles can be installed on, above or below ground level. And because of vinyl’s superior water resistance, these tiles can also be installed in moist areas such as in bathrooms and kitchens. Great kitchen ideas! This post on kitchen flooring is excellent. Very good article. All the points you make are usually the things I tell my customers when the walk into my showroom. Although I am biased towards porcelain tile and stone, I appreciate the beauty and softness of wood flooring. Would definitely recommend this article to anyone who’s redoing their home. Ever since fitted carpets came out into the market, people rarely paid attention to the wooden flooring which holds them. Most floors are designed in place for sanding. Although it is such a hard and tedious job to sand floors, some people love doing them. Your kitchen floor, besides being practical and durable, is a major design statement as well. Since it is high traffic area, hardwood flooring is a great option because it lasts a long time. This is a great piece of information on kitchen flooring, Ganka! I am glad that you shared this useful info with us. Really some cool ideas to choose a kitchen floor. Kitchen floorings should be attractive and durable as kitchen is the only place in the home with high traffic, so we have to choose the floor wisely. Thanks for sharing these ideas. What Is The Best Cookware To Buy For Your Kitchen?